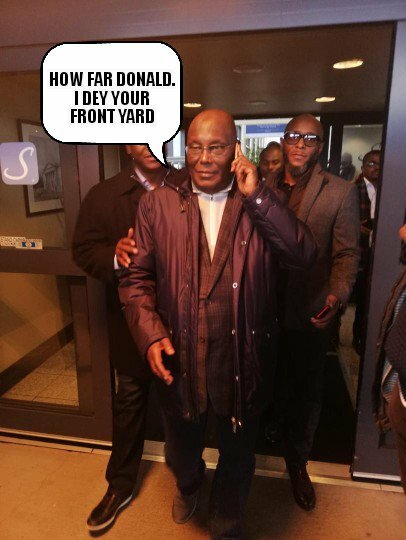 The PDP presidential candidate Atiku Abubakar stormed the U.S. yesterday and the internet went into a buzz. Quickly, a hashtag was produced: #AtikuInAmerica, and the first photos we saw of the presidential hopeful tweeted from his account was taken at the Dulles International Airport and another at the Trump International Hotel. In Washington DC, Atiku will engage in bilateral meetings with a high powered, bi-partisan delegation of U.S. congressmen who are deeply concerned and troubled about the future of democracy in Nigeria. The delegation is seeking Atiku’s views on how best the United States can support Nigeria in ensuring democracy at all levels and more importantly ensuring the will of the people prioritised at all time. That said, the longstanding knowledge was that Atiku couldn’t travel to the U.S. because of some corruption charges levelled against him, which was fanned by anti-PDP critics. But hey, Atiku is in the U.S. now and the internet had a lot to say. Gulder Ultimate search don end, Atikulated Atiku na im winam. Buhari go hear? 1 ticket to obodo Washlngton DC #AtikuInAmerica #AtikuNowThatYouAreInTheUS what is the next challenge? #WhatIsTheNextChallenge Atiku be like: bring it on, bring it on Bubu get ready! Atiku is ready.